The BBC is launching a new-look version of its travel news site later this year, with the sneak preview now online. On the BBC’s website, it says the new site will improve presentation and introduce maps for the first time. Data-handling processes will be better so it will take less time for site visitors to get information. The new site will have a wider page layout and larger text, as well as improved navigation and interactive mapping, which can be minimised if you prefer to see traffic incidents as just a text list. There will be clearer time-stamping of incidents and still images will be frequently updated from traffic jam cams showing conditions on motorways and trunk roads. The local weather forecast from the BBC Weather Centre will also be available on the site for the following six hours. For fans of the old site – the BBC insists that travel and traffic information will still be updated round the clock, and the map can be minimised, which will put the functionality of the site back to the way it used to be. 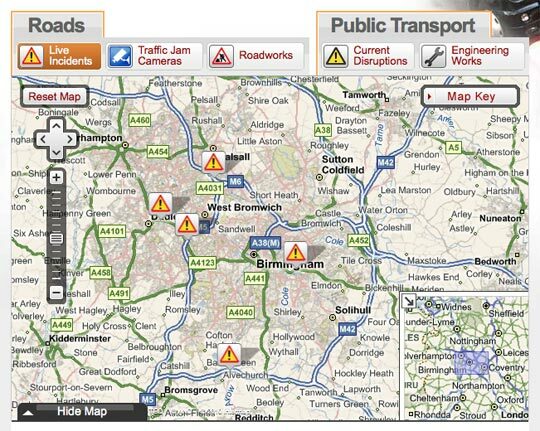 The door-to-door journey planner remains a feature, but has been made more prominent, and in the final version of the site, it will be possible to see a country-wide overview of motorways or major roads from every page. This entry was posted in Data, Multimedia and tagged BBC, maps, travel information on September 3, 2010 by Emily Sneyd. Total Film magazine has launched an iPhone app today, providing users with new location based and social media sharing services. The app, which costs £1.79, features latest news, reviews and trailers from the magazine’s website alongside content exclusive to the app such as location-based cinema listings, show times and directions. The app will also allow users to share content via email, Facebook and Twitter. The app launch follows a complete redesign of the print magazine earlier this year. This entry was posted in Mobile, Multimedia, Social media and blogging and tagged Future Publishing, iphone apps, Total Film on September 1, 2010 by Emily Sneyd. The Guardian is launching a new science blogs network to get readers discussing and debating all aspects of the science world, from palaeontology to extraterrestrial life. This is another step in the Guardian’s strategy to set up partnerships with bloggers, following in the footsteps of its recently launched law network. The science network will comprise of four regular bloggers sharing their expertise on the latest in evolution and ecology, politics and campaigns, skepticism and particle physics. A fifth blog will act as a window into other discussions going on in the science world and will also host the Guardian’s first science blog festival. The festival will showcase a new blogger every day and aims to put newbies at ease by offering lots of new places to start reading. The web world is buzzing with thousands of science enthusiasts sharing their knowledge and thoughts, but it can be very overwhelming for those not familiar with it, explains the introductory post from Alok Jha, a science and environment correspondent at the Guardian. Readers can also share any posts that especially excite (or infuriate) them by using the Guardian’s WordPress plugin that allows bloggers to republish articles on their own sites. This entry was posted in Newspapers, Social media and blogging and tagged blogging, guardian, Science journalism, The Guardian on August 31, 2010 by Emily Sneyd.